Although Fall is upon us we are not yet free from the wet, windy storms. Hurricane season can stretch as far as Thanksgiving and now that the summer craze has come to a close it’s important to check back in with your storm preparedness plans. On the East coast hurricane season starts June 1st and ends November 30th, on the West coast it starts May 15th and ends November 30th as well. During these mid-year months it’s important to know what your risks are and how to take steps to avoid them. If you live on either coast, you’re probably a hurricane veteran and know how to protect yourself and home from hurricanes. Even if you’re new to these wet windy storms information and storm tips are easily accessible online. Preparation with covered windows, flash lights, first aid kits, water and non-perishable foods are always recommended to be kept at home in case of an emergency. But what happens if your home is not your only property of concern? Emergency preparedness is more popular in residences but commercial properties, and your employees, need protection too! There are a few site-specific tips in protecting your school, apartment complex or workplace that you should consider in preparation for the months ahead. We start this by creat­ing a workplace plan. Take note of your surroundings and physical facility. Create an evacuation plan and set aside a location in the building where emergency preparedness items will be stored. Also, take advantage of the knowledge your employees have. Are any of them CPR certified? EMTs? Or volunteer firefighters? This is extremely important information you’re going to want to know in the event you need them. By planning this way everyone knows where to go and who to go to in case of an emergency. 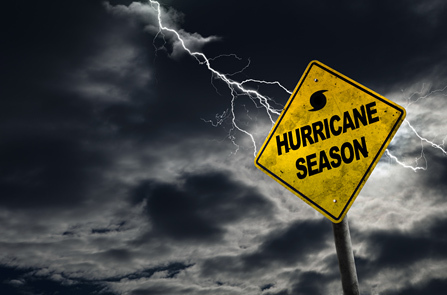 Is your facility prepared for a hurricane? Receptacles mounted outdoors or in wet or damp locations are subject to corrosion and damage from water and UV exposure. Take a look at Leviton’s line of weather-resistant receptacles and covers along with our Weatherproof covers and WetGuard® product line to defend against damp or wet environments before or after a hurricane. Along with planning in preparation for the storm your business need to plan for what happens after the hurricane is gone. Leviton has a vast array of portable temporary power products to help you restore electricity to your business after power has been lost in the storm. How will you restart your business after power has been lost? Your building should have components to provide temporary power on hand! From portable outlet boxes and power distribution boxes to single pole cam-type connectors and stage pin devices, Leviton has what you need to deliver the power you need, when and where you need it. Our line of Black and White® plugs and connectors are perfect for creating power stringers from your generator. Do you have a lot of equipment to power? 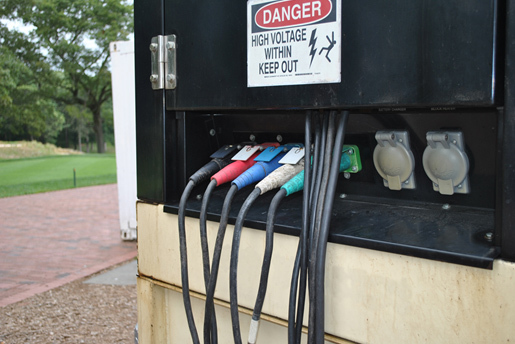 Our power distribution boxes will have your office up and running where portable power is needed. To protect your equipment and employees from electric shock a portable GFCI should be installed to your temporary power line as well. An array of these products should be kept in your facility’s maintenance closet just in case of the event where temporary power is needed in a blackout. What happens if your employees can’t go home? Your workplace may want to stock jugs of water and non-perishable foods (like you would in your home). Battery operated supplies are also a must. Consider Leviton’s LED battery operated lights, they are light weight, portable and offer a bright light without electricity. A building evacuation plan is crucial for any emergency and should be practiced regularly. A document should be prepared and distributed containing the location of emergency supplies, medical equipment and a list with medically or emergency preparedness certified employees. Be sure to know how to turn off your heating, ventilation and cooling systems in the event you need to. Flood risk- Is your business below sea level? Do you have machinery at a lower level? If you have ample time and knowledge of an oncoming storm you may want to move some machinery to higher levels or shut them off entirely to avoid electric shock or damage to your business’ equipment. 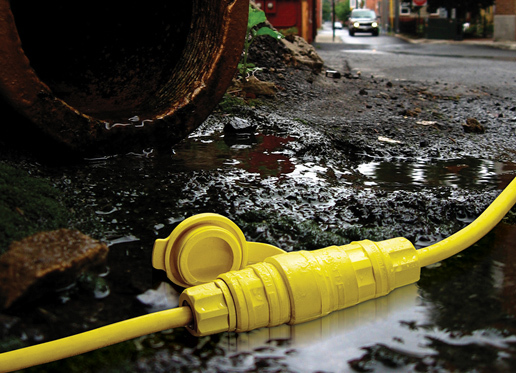 The WetGuard® product line by Leviton consists of plugs, connectors, modules and covers that protect your machinery and devices from water, most acids, alkalies, grease, oils and solvents that can be found in floodwater. Wind- Do you have outdoor machinery? It is important to make sure all outdoor equipment is secure and is regularly inspected for instability. With hurricanes come wind and the last thing you want is extra damage to your property because of unforeseen variables. Be sure to double check the surroundings of your property (weak trees or low powerlines) and even turn off the machinery to avoid electric shock or fire. Leviton offers several locking devices found in our Rhino-Hide®, WetGuard®, Pin and Sleeve, and Black and White® plugs and connectors that will endure extreme environments like hurricane force winds. At this point you should be able to come up with a very solid plan. Your equipment and personnel have been accounted for and there are back up plans for the worst case scenario. What’s left to do? Get people involved! As an employee check and see if your workplace has an established emergency preparedness plan or committee. If they do not maybe you can suggest this or even volunteer to kick off the mission yourself! Use what you’ve learned here and utilize the resources and documents online to assist you. You would be doing a noble service for you and your co-workers!